Each year the Guild and charitable patrons gather funds together and bestow a scholarship on a lucky high school senior headed to art college. This year, the results we so close, the applicants' portfolios and essays were all SO good that we decided to give three awards this year!! Here are our three lucky talented artists! DeAnna Boyer earned the top score this year in the Arts Guild's annual scholarship competition. A 2018 graduate of Bermudian Springs High School, she will attend the Ringling College of Art and Design in Sarasota, FL in the fall. While a student at Bermudian, DeAnna enrolled in the Product Design course. Students in this course propose, describe, analyze, and illustrate new products. Her teacher was so impressed with one design that he recommended she enter it in a statewide competition. Her product, an innovative approach to an airport security system, won first place, along with other awards. 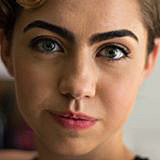 DeAnna will major in Illustration while attending Ringling, and wants to become a storyboard or concept artist in the computer animation industry. Her ultimate dream is to work for Disney or Pixar. Ringling College of Art and Design is well known as a recruiting ground for these companies, so DeAnna will be in the right place, and the Arts Guild scholarship selection committee believes that she has the artistic skills and overall ability to excel as she works to reach her goals! Dorothy Marquet finished in a virtual tie for second place in what may be the closest finish ever in our annual competition. And she is certainly a deserving winner! In an essay she wrote about her art, Dorothy said: "In my photography, paintings and drawings, I value intense color and movement." She cites the paintings of Vincent Van Gogh as an influence in her artistic vision. Dorothy also wrote about her goals to "travel often and establish a job in landscape and portrait photography. I want to tell a person's story and capture the history of a community through photographs." 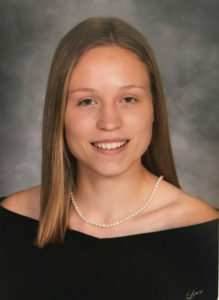 A 2018 graduate of Bermudian Springs High School, she will attend the Rochester Institute of Technology this fall, majoring in fine art photography. In addition to photography, she plans to continue to study drawing and painting. The scholarship selection committee believes that Dorothy will thrive as she works towards her chosen career in art! Sarah Lenker also tied for second place in our competition, and we are happy to include her among our winners! A 2018 graduate of Bermudian Springs High School (Bermudian has some talented ladies! ), she will also be attending the Rochester Institute of Technology this fall, majoring in photojournalism. 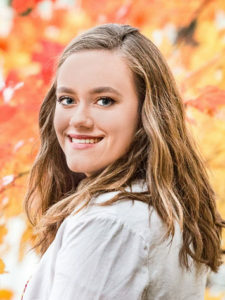 The scholarship selection committee believes that Sarah, also an Arts Guild member, has all the qualities needed to succeed as a student at RIT and in her chosen career! In the essay she wrote for this competition, Sarah describes how she developed an appreciation for the importance of stories even as a young child. She says: "My love for stories is why I have chosen a career in photojournalism. When I look at the world around me, I see stories waiting to be told...telling [stories] has always been my one true passion." Sarah goes on to say that she feels a duty to "use my skills to give a voice to those who can't be heard. and those who go unnoticed by society."